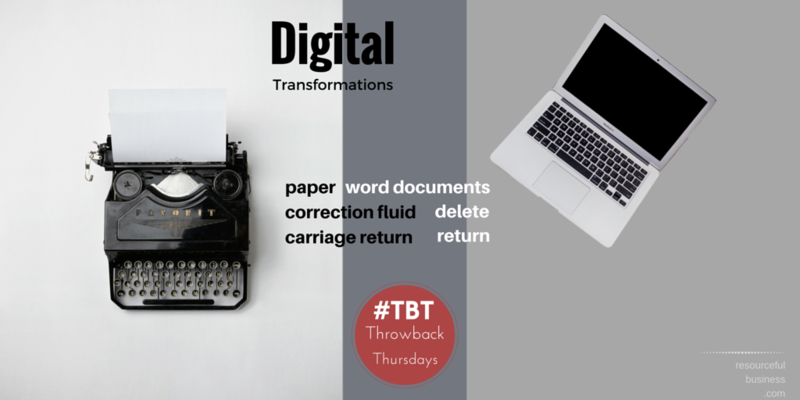 Resourceful Business (RB) is launching a new Throwback Thursdays series called Digital Transformations. We are highlighting the everyday “disruption” from digital technologies that continues to unfold all around us. At RB, we are hard-pressed to imagine aspects of our personal or working lives that have not been reshaped in some way by digital technology. This morning, we are fondly remembering the days of typewriters with white paper and the noisy carriage return. Typo? It was correction fluid to the rescue. The digital transformation has ushered in laptops, desktops, and iPads, and we have the luxury of creating our documents online. Typos disappear with the click of a delete button. And, the rackety carriage return? A tap on the return key will now suffice.